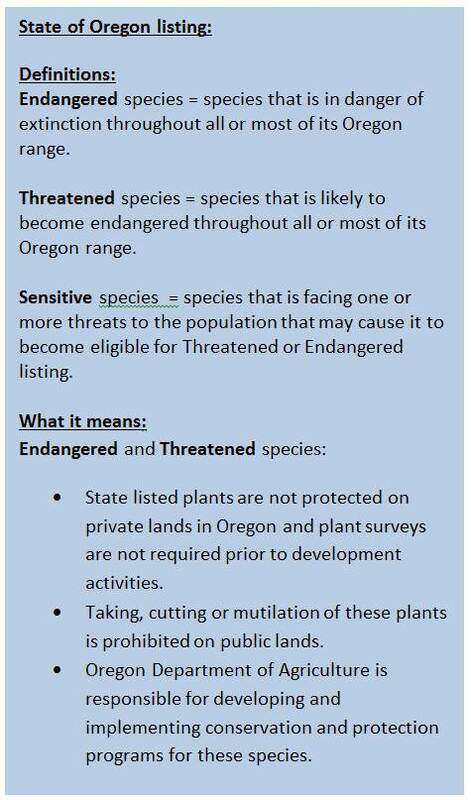 Three plant species in the project area are federally or state listed as either Threatened or Endangered. Two additional listed species occur just south of the project area; suitable habitat for these species occurs within project boundaries. Habitat loss is the primary reason behind population declines for most species. Table 1. 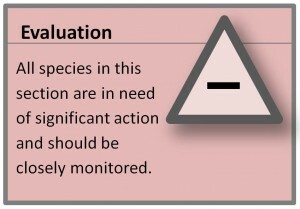 Summary of rare and endangered species with ranges within the project area. Photos: Oregon Department of Agriculture, except western lily (USFWS). Five rare or endangered plant species are known or thought to occur within the project area: Pink sand verbena (Abronia umbellata breviflora), Salt marsh bird’s beak (Chloropyron maritimum palustre, formerly Cordylanthus maritimus palustris), Silvery phacelia (Phacelia argentea), western lily (Lilium occidentale), and Wolf’s evening primrose (Oenothera wolfii)(Figure 1, Table 1). This data summary describes the current status and trends of those species in the project area. Pink sand verbena is listed as Endangered by the State of Oregon due to small populations facing numerous threats. It is federally listed as a Species of Concern (see sidebars). Once occurring from British Columbia to central California, the range for pink sand verbena has shrunk to limited populations in southern Oregon and northern California. Rittenhouse (1996) described fewer than 10 populations (groups of reproductive-age plants) remaining in Oregon by 1996. Ten years following Rittenhouse’s report, 3-5 “wild” populations remained, varying from year to year (wild populations do not include reintroduced/restored plants/populations)(Kaye et al. 2006). The western lily is listed as Endangered at both the federal and the state level. Except where otherwise noted, the following information comes from USFWS (2014). Since its federal listing in 1994, western lily populations have continued to decline in both numbers and distribution (USFWS 2009). Within and near the project area, many known populations have been lost (e.g., some populations at Shore Acres and Sunset Bay State Park); other populations have grown (Hauser Bog) or have remained relatively stable (Bastendorff Bog)(Figure 1). Within the project area, the Hauser Bog population was recently (2014) estimated at 776 reproductive individuals. This total includes individual plants resulting from 498 bulbs planted in 2013 by the Oregon Department of Agriculture (ODA) to augment the population. Ninety percent of the Hauser Bog is located on private property, with the remainder on an Oregon Department of Transportation (ODOT) right-of-way designated as a Special Management Area. A newly discovered western lily population (2013) was documented within the project area at Indian Point in South Slough (Figure 1). A cursory population estimate of reproductive and nonreproductive plants indicated that the Indian Point site may contain one of the largest populations in Oregon. The population resides entirely on state of Oregon land (acquired in 2014) which is managed by the South Slough Reserve. Just outside the project boundary, Bastendorff Bog (part of Sunset Bay State Park) supported 47 reproductive individual western lily plants in 2014, and increase from the 10 plants found in 1994. The increase can be partially attributed to habitat maintenance including the removal and thinning of encroaching vegetation. In addition to the 47 reproductive plants counted in the natural or ‘wild’ population in 2014, over 100 western lilies of all age classes were observed, the result of augmentation with 173 bulbs in 2013 (Brown et al. 2013). Other historic populations at Sunset Bay State Park appear to have been lost due to competition from Sitka spruce and other species (USFWS 2009). Adjacent to Sunset Bay State Park, Shore Acres State Park contains several small, declining populations. Although a complete survey was not conducted, only 5 reproductive plants were observed in 2014, down from 53 in 2002. Wolf’s evening primrose is considered a federal Species of Concern and is listed as Threatened by the State of Oregon. Although not known to occur in our project area (the nearest population occurs in Port Orford), suitable habitat does exist in the project area for wolf’s evening primrose. The non-native large-flowered evening primrose (Oenothera glazioviana), considered a major threat to the native species, does occur in the project area (DeWoody et al. 2008). See Why is it happening? below for more information on this threat. According to Currin and Meinke (2004), there were seven known populations of wolf’s evening primrose remaining in Oregon in 2004. They describe population sizes in Oregon as ranging from 40 to several thousand individuals. 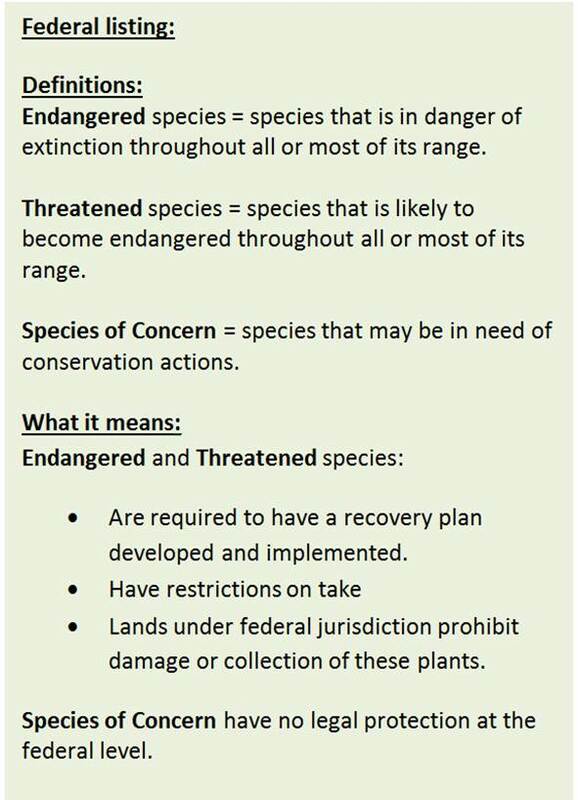 Except where otherwise cited, the following information comes from USFWS 2009. The decline of western lily populations began historically with heavy extraction by the horticulture trade, followed by habitat loss for development and agriculture, particularly the development of cranberry bogs. Conversion of western lily habitat to cranberry bogs is believed to have contributed to the loss of hundreds of acres of lily habitat in the area between Bandon and Port Orford in the past few decades. This is because cranberries and western lilies share a proclivity for soils that remain saturated and facilitate the seasonal pooling of water. These soils (known as the Blacklock/Bullards/Bandon Complex) are common south of Bandon. Western lilies are extremely sensitive to site hydrology. The bulbs cannot survive year-round inundation but are reliant on sufficient soil moisture late into the growing season to avoid desiccation during the summer months (Imper 1997b). For example, at Hauser Bog, plants are all within 6” of the same elevation, illustrating the close relationship between bulb viability and soil moisture. Vegetative succession may speed the western lily’s decline by shading the plants and lowering the site’s water table. This has been cited as a potential reason for the decline of the Bastendorff Bog population, where trees are encroaching upon the formerly open habitat due to lack of disturbance, most likely fire. Historically fires are believed to have maintained early seral conditions in western lily habitat. Deer grazing seriously reduces reproductive success by consumption of fruit and flowers. The Hauser and Bastendorff populations have exhibited high loss due to deer herbivory. Light cattle grazing, however, appears to have little impact. 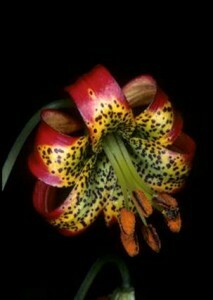 Lilies tolerate trampling to some degree and may actually benefit by having their seeds pressed into the ground. Cattle also keep surrounding vegetation controlled, and their manure increases soil fertility. Populations under 5,000 individual plants are additionally threatened by loss of genetic diversity. This limits long-term adaptability to stressors, including disease or the local effects of climate change (e.g., changes in air temperature and hydrology). Furthermore, populations with less than 500 individuals may suffer from the deleterious effects of inbreeding. Most of the populations in Oregon number less than 500 individuals. According to the Center for Plant Conservation (CPC 2010b), a unique threat to this species is genetic dilution due to hybridization with a non-native ornamental plant of the same genus, the large-flowered evening primrose. Wolf’s evening primrose cannot accept pollen directly from the large-flowered evening primrose, but can accept pollen from hybrid offspring produced by a crossing of large-flowered evening primrose with pollen from wolf’s evening primrose (Imper 1997a). This pollen issue could eventually lead to genetic extinction for Wolf’s evening primrose. Hybrids are more ‘fit’ than parents of either species, allowing them to reproduce and expand their range more rapidly (Imper 1997a). Loss of habitat in a limited range (primarily to the invasive European beachgrass) and destruction from herbicides (many populations are along Highway 101) are secondary threats to this species (Currin and Meinke 2004). Ranging from Coos Bay, Oregon to Eureka, California, all known populations of this species occur within 6 km (3.7 miles) of the coast. According to USFWS (2009), the western lily is a perennial species that dies back each winter. These plants require either impermeable mineral soils or organic marsh soils, both of which keep the bulb moist late in the dry season. Reproductive individuals require open, unshaded habitats. Bright red flowers are hermaphroditic (male and female), and are primarily pollinated by hummingbirds. According to CPC (2010b), wolf’s evening primrose is a biennial species (i.e., dies after two years) producing small yellow flowers its second year. Imper (1997a) described the habitat preference for this species. He found they only occur in coastal areas and prefer moist but well-draining sandy soil habitat along coastal bluffs or beaches, sheltered from northwest winds. He added that although it prefers moderately disturbed sites, it does not compete well with other plants. It can tolerate high salt concentrations in the soil, although hybridized versions are not as tolerant of salt. This species thrives with some disturbance. In fact, the Port Orford population is located on a beach where dumping of dredge spoils provides periodic disturbances and keeps European beachgrass in check (Currin and Meinke 2004). Surprisingly, this population is doing well enough that it is the seed source for experimental reintroductions at other locations (Currin and Meinke 2004). Locations within and surrounding the project area that now have populations include the North Spit, and a population at Bastendorff Beach State Park (Figure 1). A third site near the mouth of South Slough was surveyed in 2010 but no individuals were found (Giles-Johnson and Kaye 2012). The North Spit population was considered extinct until a successful reintroduction from a large wild Port Orford population in 1997. The North Spit site now contains the largest population of pink sand verbena in the world (Kaye et al. 2006). Kaye (2004) described how multiple sites in Oregon were reintroduced with pink sand verbena, but the North Spit was by far the most successful because: 1) location – the population is behind the foredune and thus not exposed to winter storm overwash; and 2) annual habitat maintenance – the site is in an area occupied by the federally threatened western snowy plover and therefore receives annual mechanical treatments to remove European beachgrass (Ammophila arenaria). This disturbance regime favors both plovers and pink sand verbena, both of which depend upon sparsely vegetated open sand habitats. The North Spit population had 1700 plants the first year of reintroduction and peaked in 2012 with nearly 350,000 reproductive individuals (Giles-Johnson and Kaye 2012). Giles-Johnson and Kaye (2012) also describe the history of pink sand verbena at the Bastendorff site. Despite annual reintroductions of both seeds and transplants starting in 1995, by 2000 no plants were found at the Bastendorff site. After seeding again in 2002, 13 individuals were established that year, substantially increasing to 110 individuals the following year with no new seeding effort. The Bastendorff population peaked in 2005 with 536 total plants (410 of which were reproductive), but drastically declined to 2 plants in 2010. Listed as a Species of Concern federally and as Endangered by the State of Oregon, the majority of Oregon occurrences of salt marsh bird’s beak occur in the Coos estuary (Rittenhouse 1996). Of the multiple populations within the project area, the largest populations in 1999 were found near Empire (~25,000 plants) and the Pony Slough (~10,000 plants)(Rittenhouse 1999)(Figure 1). The population on United States Bureau of Land Management (BLM) land at the North Spit in 2001 was estimated at 20,000 plants (BLM 2006). Rittenhouse (1999) additionally documented a large population (~3,000 individuals) east of the distant water fleet docks south of the Charleston Bridge (Figure 1). The North Spit population was damaged by off-road vehicle use, which led BLM to install traffic barriers. A report by Giles-Johnson et al. (2013) noted that after protection was initiated the species recovered substantially, peaking at ~670,000 individuals in 2012. Since then, the population has begun to slowly decline. The absence of disturbance, which allows pickleweed (Salicornia depressa) and western marsh-rosemary (Limonium californicum) populations to spread, has been potentially inhibiting salt marsh bird’s beak’s reproductive success. It should be noted that other salt marsh bird’s beak populations (e.g., in South Slough) remain robust in undisturbed locations (C. Cornu, pers. comm., 2014). Silvery phacelia is considered a Species of Concern federally and is listed as Threatened by the State of Oregon. No known occurrences of this species occur in the project area; however, suitable sandy bluff habitat (e.g., in South Slough or the North Spit) occurs here (SSNERR 2013). Close-by populations exist, the nearest being north of Bandon at the Oregon Dunes Golf Resort (Kalt 2008). This is also the largest population with ~3,000 individuals in 2007 (Kalt 2008). According to Curry (2014), of 36 populations documented since 1916, only 22 are presumed to still exist, all in Oregon. Six new populations have been discovered, also in Oregon. The remaining populations are small (average populations are under 100 plants), highly fragmented, and most appear to be declining (Kalt 2008). Small fragmented populations are especially common in areas where European beachgrass dominates (Rittenhouse 1995 as cited in Curry 2014), suggesting that beachgrass adversely affects this species. As with many rare and endangered species, pink sand verbena’s decline can be attributed to habitat loss. The biggest factor is dune stabilization and competition for space from the non-native European beachgrass; a secondary threat is disturbance from off-road vehicles (Kaye 2004). Additionally, bee species native to dune habitats are the primary pollinators of pink sand verbena (CPC 2010a). However, populations of these solitary bees are negatively correlated with dune communities dominated by European beachgrass (Julian 2012). The primary threats to salt marsh bird’s beak are habitat loss due to wetland alterations (excavation/filling) and repetitive disturbances (e.g., foot traffic, off-road vehicles). This species is also particularly sensitive to water pollution and petroleum spills (BLM 2006). The primary threat to silvery phacelia is competition from non-native species, especially European beachgrass and gorse (Ulex europaeus)(Kalt 2008). Russo et al. 1988 attributed the silvery phacelia’s decline to changes in the orientation of the Oregon coast’s dune field valleys (technically referred to as “slacks”) as a result of the establishment of European beach grass. Historically, many beaches had no foredune running parallel to the ocean shore. Instead, dunes and associated slacks were oriented perpendicular to the shore, shifting with seasonal changes in prevailing winds. The introduction of European beachgrass stabilized the dunes, resulting in their current orientation (parallel to the beach) and steep foredunes. The stabilized foredune greatly reduces sand supply to interior moving dunes, limiting their dynamic nature. Since the introduction of European beachgrass, any species populations adapted to the historically dynamic dune habitat, such as the silvery phacelia, have declined. Other threats to silvery phacelia are habitat loss from coastal development and destruction from off-road vehicles (Curry 2014). 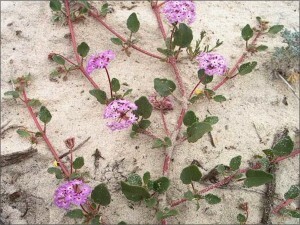 According to Kaye (2004), pink sand verbena lives at or below the driftwood line on coastal beaches. Wave overwash from winter storms obliterates adult plants each year requiring the population to re-establish itself each spring from seed. Because of this, population sizes and locations fluctuate widely year to year. Winter storms are highly beneficial to this species as they deposit new sand substrate and carry seeds along shorelines. Storms also remove competitor plants, helping long-term survival of the population. Salt marsh bird’s beak ranges from Morro Bay, California to Netarts Bay, Oregon (Giles-Johnson et al. 2011). According to Chuang and Heckard (1971) this annual plant is a hemi-parasite (i.e., it derives much of its nutrients from other plants), though it does not appear to have a preferred host species. Consequently, habitat quality is likely a more important factor to bird’s beak populations than specific host species presence (Giles-Johnson et al. 2011). Preferred habitat for this species is upper elevation salt marshes (~7.5-8.5’ above MLLW) with moderate vegetation cover, which allows light to penetrate to the soil (Kaye 1991 and USFWS 1984, as cited in Rittenhouse 1999). Rittenhouse (1999) notes that annual fluctuations in population sizes are highly variable, which is typical of an annual species. Ranging from Coos County, Oregon to Del Norte County, California, silvery phacelia is a perennial evergreen trailing herb in the forget-me-not family that grows on unstabilized or partially stabilized coastal sand dunes at elevations below 65 feet (CPC 2010c). CPC (2010c) notes that bees are the primary pollinators of this species, especially the native leafcutter bee (Anthidium palliventre). Brown, J., K. Amsberry and R. J. Meinke. 2013. Recovery-Based Propagation and Outplanting of Lilium occidentale: Preparation for Outplanting Year 3 (2011). Oregon Department of Agriculture, Corvallis. 21 pp. Bureau of Land Management (BLM). 2006. Final North Spit Plan: An Update to the Coos Bay Shorelands Plan of 1995. Coos Bay District Office, North Bend, Oregon . 104 pp. Chuang, T. I. and L. R. Heckard. 1971. Observations on Root-Parasitism in Cordylanthus (Scrophulariaceae). American Journal of Botany. 58: 218-228. Currin, R. and R. Meinke. 2004. Establishment of Two Experimental Populations of Wolf’s Evening Primrose (Oenothera wolfii). Final Report for U.S. Fish and Wildlife Service. 32 pp. Curry, T. R. 2014. Petition to List Silvery Phacelia (Phacelia argentea) as Threatened or Endangered under the Endangered Species Act. Center for Biological Diversity, Oregon Wild, Friends of Del norte, Oregon Coast Alliance, Native Plant Society of Oregon, California Native Plant Society, Environmental Protection Information Center, Klamath-Siskiyou Wildlands Center. 20 pp. DeWoody, J., L. Arguello, D. Imper, R. D. Westfall, and V. D. Hipkins. 2008. Genetic evidence of hybridization between Oenothera wolfii (Wolf’s evening primrose) and O. glazioviana, a garden escape. Madroño. 55(2): 132-142. Giles-Johnson, D. E. L., A. S. Thorpe, and E. C. Gray. 2011. Habitat Monitoring and Improvement for Cordylanthus maritimus ssp. palustrs: 2011 Progress Report. Progress Report. Prepared by Institute for Applied Ecology for Bureau of Land Management; Corvallis, Oregon. 29 pp. Giles-Johnson, D. E. L. and T. N. Kaye. 2012. Abronia umbellata var. 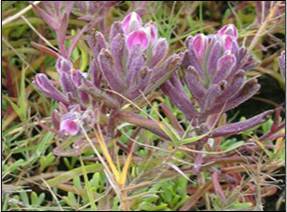 breviflora on the Oregon Coast: Reintroduction and Population Monitoring. Prepared by the Institute for Applied Ecology for Bureau of Land Management, US Fish and Wildlife Service, USDA Forest Service and Oregon Department of Parks and Recreation. 74 pp. Giles-Johnson, D. E. L., E. C. Gray, and T. N. Kaye. 2013. Habitat Monitoring and Improvement for Cordylanthus maritimus ssp. palustris: 2012 Progress Report. Prepared by Institute for Applied Ecology for Bureau of Land Management; Corvallis, Oregon. 48 pp. Imper, D. K. 1997a. ‘Ecology and Conservation of Wolf’s Evening Primrose in Northwestern California’, in Kaye, T.N., A. Liston, R.M. Love, D.L. Luoma, R.J. Meinke, and M.V. Wilson (eds. ), Conservation and Management of Native Plants and Fungi. Native Plant Society of Oregon, Corvallis. 296 pp. Imper, D. K. 1997b. ‘Ecology and Management of the Endangered Western Lily (Lilium occidentale) in Northwestern California’, in Kaye, T.N., A. Liston, R.M. Love, D.L. Luoma, R.J. Meinke, and M.V. Wilson (eds. ), Conservation and Management of Native Plants and Fungi. Native Plant Society of Oregon, Corvallis. 296 pp. Julian, L. S. 2012. A Comparison of Bee Fauna in Two Northern California Coastal Dune Systems. Thesis (M.S. )–Humboldt State University. Kalt, Jennifer. 2008. Appendix C: Status Review and Field Inventory for Silver Phacelia: Phacelia argentea (Hydrophyllacease). In: Applicant’s Statement, Proposed Findings, and Supplemental Exception Statement for 2010 Text Amendments to Bandon Dunes Resort Master Plan and Bandon Dunes Resort Zoning Ordinance. 2009. Department of Land Conservation and Development. 226 pp. Kaye, T. 1991. Population monitoring and habitat analysis for salt marsh bird’s-beak (Cordylanthus maritimus ssp. palustris). Oregon Department of Agriculture. Report submitted to Coos Bay BLM. 40 pp. Kaye, T. N. 2004. ‘Reintroducing the Endangered Pink Sand-Verbena to Pacific Coast Beaches: Direct Seeding and Out-Planting’, in Brooks, M.B., S.K. Carothers, and T. LaBanca (eds. 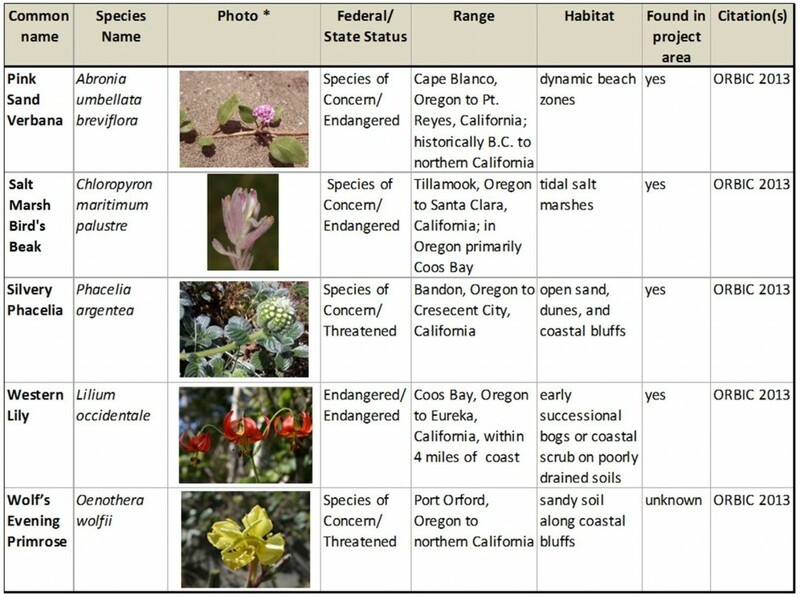 ), The Ecology and Management of Rare Plants of Northwestern California: Proceedings from a 2002 Symposium of the North Coast Chapter of the California Native Plant Society, California Native Plant Society, Sacramento, CA, p131-139. Kaye, T., N. Brian, D. Segotta, and N. Bacheller. 2006. Conservation Strategy for Pink Sand-Verbana (Abronia umbellata ssp. breviflora). Prepared by the Institute for Applied Ecology for Bureau of Land Management, USFS Siuslaw National Forest, and Oregon Department of Parks and Recreation. 44 pp. Oregon Biodiversity Information Center (ORBIC). 2013. Rare, Threatened and Endangered Species of Oregon. Institute for Natural Resources, Portland State University, Portland, OR. 111 pp. Rittenhouse, B. 1995. 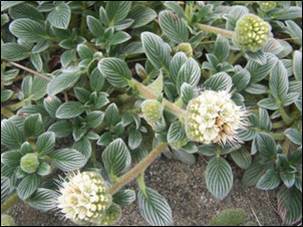 Conservation Strategy for Silvery Phacelia (Phacelia argentea A. Nels. & J.F. Macbr.). Bureau of Land Management, Coos Bay District. 13 pp. Rittenhouse, B. 1996. Botanizing the Southern Oregon Coast (Coos Bay to Port Orford). Kalmiopsis. 6:1-8. Rittenhouse, B. 1999. Status of Salt Marsh Bird’s Beak (Cordylanthus maritimus ssp. palustris) in the Coos Bay Estuary. Status Report by Bureau of Land Management, Coos Bay office. 10 pp. Russo, M., A. Pickart, L. Morse, and R. Young. 1988. Element Stewardship Abstract for Ammophila arenaria. The Nature Conservancy, Arlington, Virginia. 12 pp. South Slough National Estuarine Research Reserve (SSNERR). 2013. The South Slough Shorelands Project. Proposal submitted to US Fish and Wildlife Service. 121 pp. United States Fish and Wildlife Service. 1984. Recovery Plan for Salt Marsh Bird’s-Beak (Cordylanthus maritimus ssp. maritimus), US Fish and Wildlife Service, Portland, Oregon. 92 pp. United States Fish and Wildlife Service (USFWS). 2009. Lilium occidentale (Western lily) 5-Year Review: Summary and Evaluation. U.S. Fish and Wildlife Service, Arcata, CA. 48 pp. United States Fish and Wildlife Service (USFWS). 2014. [Update to the 5-year Review]. Unpublished data.